After a splendid meal at the Cowshed on Whiteladies Road which included a rather delightful slow-cooked belly of pork with lentils, bacon and grilled vegetables, Duncan drove us round the city to find more street art. One of Banksy's most famous pieces in Bristol is the 'Adulterer' on the side of the Sexual Health Clinic in Park Street. The council allowed it to stay when it appeared in 2006 and even took steps to clean it up a bit when it was attacked with splodges of blue paint. 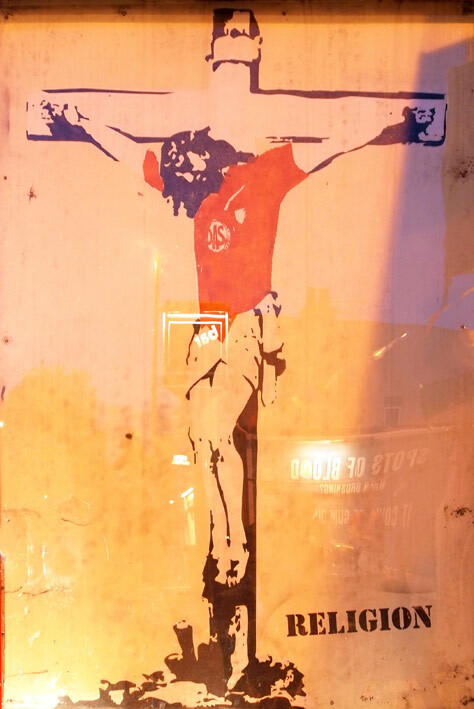 The tour ended with a photo outside the ‘Bar BS3’ pub on Ashton Road where a few chaps, fuelled by refreshment from the England game spoke to me in staccato vulgarity-laden sentences about Banksy’s crucifixion work depicting JC in a Bristol City shirt. ‘It’s a faarkin poster, mate’. 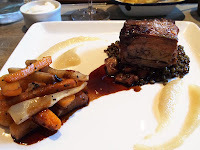 With the camera resting on the edge of their table, I tried to get a decent photo with minimal glare off the protective Perspex sheet - but this was not a time for camera faffery. I bid them adieu and scarpered in a calm, dignified and confident manner. Duncan advised that this was the correct strategy.